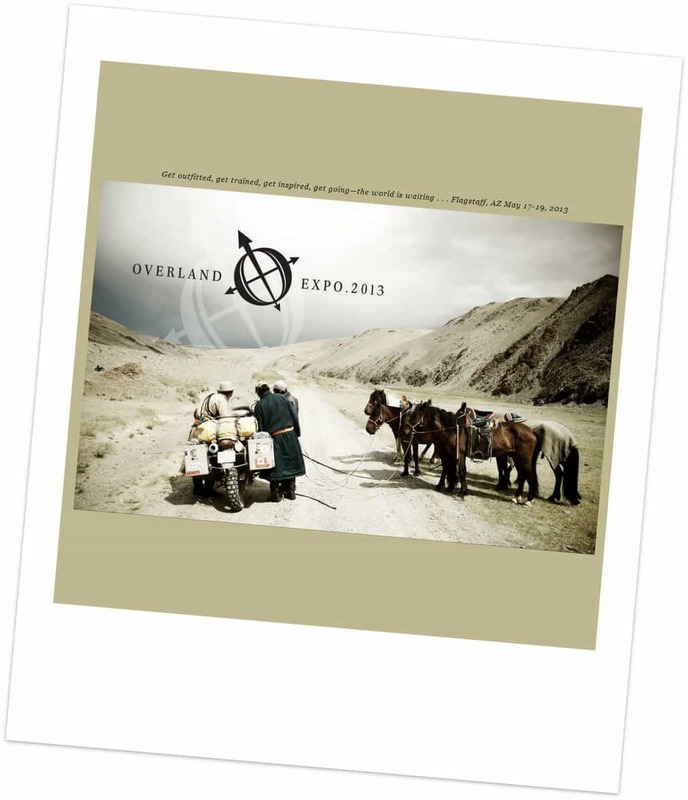 Overland Expo - Get outfitted, get trained, get inspired. Get going! Overland Expo – Get outfitted, get trained, get inspired. Get going! I spent the past few weeks exploring southwest Utah: from Zion National Park, to Bryce Canyon (we even got snow! ), to Grand Staircase-Escalante National Monument. There is some amazingly surreal and sublime scenery throughout this area, and while I wasn’t doing any climbing, I was having a blast just exploring these new areas that I’d never been. Through Twitter I saw some chatter about the upcoming Overland Expo in Flagstaff, Arizona. I had never heard of it before, but my interest was piqued. Doing more research I discovered that it is one of the “world’s largest events for do-it-yourself adventure travel enthusiasts” that “educates and inspires people to get out and explore the world, by bike or vehicle.” An event targeting people taking the road less traveled, living out of their vehicles and on the (dirt) road–geared more toward the international road trip, off roading crowd, and not the RV crowd. While it’s not exactly what I’m doing, it did sound up my alley, and I figured that I might, at the least, get more insight into how other people rig their trucks, vans, and other vehicles to live out of for the long term, maybe some of which would be applicable to my situation. Flagstaff was only 4-5 hours from where I was going to be, and the Day Pass tickets were only $35 for the weekend, so I planned to attend. Check out my comprehensive article about how to plan a road trip, as well! After a few days in the backcountry of Grand Staircase-Escalante National Monument, backpacking Coyote Gulch (photos here), I was heading west past Bryce Canyon along the scenic Highway 12, when my truck felt like it shifted gears and the check engine light simultaneously illuminated… Pressing the gas pedal gave me no acceleration whatsoever. I continued coasting down the hill until I found a dirt shoulder to pull off onto. Turning the key just made the truck whine but it wouldn’t turn over. Not cool. Thankfully I (barely) had cell service where I broke down so I was able to call AAA (though the call dropped a few times) and arrange for a tow from Bryce Canyon Towing. I have AAA Premium membership which covers tows up to 200 miles (a must if you are frequently out in these remote areas! ), but the towing company was giving me a bunch of push back about taking me to Cedar City, the nearest major town–80 miles away. It was getting late, they just wanted to take me down the road to Panguitch. Thankfully, they found another driver who was more amenable to taking the 160+ miles round trip drive. I got loaded up and had him drop me and the truck off at Above All Auto Repair in Cedar City, the closest AAA preferred auto repair place. They also had pretty good reviews on Yelp and elsewhere. They are in a weird part of town though, out by the airport and surrounded by a bunch of farmland. I ended up just sleeping in the back of my truck, as usual, so I didn’t have to shell out for a hotel. My timing chain had broke, a pretty unusual occurrence, perhaps exacerbated by the timing guides being out of alignment or something, and that it would cost me upward of $1,300 bucks. OUCH. My truck should be ready by the next morning, though that would mean missing the first day of festivities at the Overland Expo, unfortunately (which I had already paid for). On the plus-side I went and grabbed a Motel 6 room and had high speed WiFi, a shower, a bed, and even HBO. All of which are luxuries to me, and which I fully utilized, particularly the WiFi and HBO. In my stranded, wheel-less state, I started doing more online research on my old truck, a ’91 Toyota Pickup. I realized that it was actually known as a Toyota Hilux (Fifth Generation) throughout the rest of the world, renowned for its toughness and indestructibility. Like the AK-47, the Hilux is the trusted brand of rebel and insurgent groups the world over. The British show Top Gear actually has a segment where they attempt to destroy a Hilux by smashing it into and with numerous things, submerging it in the ocean, setting it on fire, and placing it a top a high rise building that they implode. It still worked–apparently their timing chain never broke! I do wish I was more mechanically inclined. Something I’d like to work on in the coming years… Auto Repair for Dummies? The ol’ truck was back on it’s feet the next morning and I was back on my way to Flagstaff. A day late, and way more than a few dollars short. I missed all of the seminars and discussions on Friday, unfortunately. But I was able to make it in time for that evening’s showings in the Adventure Travel Film Festival. I caught Pedal, Paddle and Push a short film about a group of friends fat biking and pack rafting in Alaska. The film was full of fantastic scenery, but could have been much stronger with some solid narration or voice-overs explaining what they saw, felt, or experienced. Pretty pictures only go so far. That was followed up by a pretty awesome feature length film called Trabants Across Africa where a group of Czech friends drive two old Communist produced Trabant cars (Time magazine named it one of the 50 worst cars ever made) from Prague to Cape Town, South Africa. Basically everyone said it was impossible that these cars could make the journey, but they set out to prove them wrong–that even with the worst possible vehicle, they could still have a grand adventure. They had plenty of problems and challenges, but they made it in the end. Too often, it seems, we feel that we need to have the latest and greatest ‘thing’ in order to do whatever it is we want to do. This is the nature of our consumer culture. I need a $4,000 carbon fiber road bike to go pedal around on the weekend. I need a super ultralight $400 cuben fiber shelter to be an UL backpacker. I need a $1,000 espresso machine to make good coffee at home. I need a fully outfitted Land Rover with solar panels, sat phones, winches, and a rooftop tent to “overland” Africa. This group of Czech buddies shows that’s just not true. Indeed, this was a theme that would repeat itself throughout the weekend… You don’t need tons of money and all the latest and greatest gadgets to get out there and have fun. Frequently it appeared to me that the Overland Expo was somewhat at odds with itself. On one hand you’ve got 100’s of vendors that are trying to sell you all manner of vehicles, accessories, and what have you to enable or facilitate your adventure, or even those companies that charge thousands of dollars for a couple week-long motorcycle tour. While what the majority of the films, presenters, and roundtable discussion folks would espouse was the exact opposite, and even directly call out the aforementioned companies, by saying you don’t need ALL that stuff to have an adventure. The more you spend on hard goods, the less you can spend on the actual experience. There is a lot of important truth to that statement, and one that holds true across many, many hobbies (or even life). It can also act as a barrier (conscious or subconscious), I just need to get this, or need this much more money, or this other thing before I can start X Adventure. You can always find excuses to delay action. Saturday morning I spent a lot of time at the roundtable discussion area throughout the day. First, for a discussion on Borders, Checkpoints, and Bribes, which had a major focus on overlanding the Americas. Ever since watching Long Way Round and Long Way Down about two guys riding from London through Russia and on to New York on one trip and then riding from London to Cape Town on another, I’ve had this periodic fantasy about making the overland journey to Patagonia (fueled by 180° South and the original Chouinard film, as well). Second, I caught “What’s Overlanding All About? A Philosophical Discussion”. To boil it down, the discussion seemed to conclude that real overlanding and real adventure is all about traveling through many different third world countries by some sort of vehicle under your control (air travel and public transportation doesn’t count). America, Canada, and Europe don’t count. It’s all about Central and South America, Africa, or Asia. The logical extension also seemed to be that quantity of ground or countries covered is superior to quality or duration of stay in a given country, and that this form of travel was a much more “real” way of seeing the world. I’ll admit, I sort of bristled at some of these implications. For one, I fall on the opposite end of the spectrum, when I’m visiting a foreign country, I would much rather fully dedicate myself to exploring that particular country, not just using it as a jumping off point to visit every other neighboring country. I want the full immersion. Both when I lived in Italy and Yemen, I spent virtually the entire time in each respective country. When I was living in Yemen, I spent every day out there in the city, interacting with locals, and doing all sorts of mundane tasks. Is that more or less real than driving a motorcycle across the country? Occasionally interacting with locals when you need gas, food, or get stopped at a checkpoint? There seemed to be that particular element from the international travel crowd that you encounter… “I’ve visited 43 countries.” “I’ve been on six continents.” Where the number of places visited is of utmost importance and is more about checking off boxes. It tells nothing of the nature or quality of the stay and interaction. Did they just hang out with the expat crowd in the bars, condescending over the “backwards and primitive” locals? Does that count as visiting a country any more so than an airport layover? For two, I also took a little umbrage with the implication that my own journey where I’ve been on the road for a few months now, exploring my own country, living in my truck, etc, is somehow less “real” or “adventurous” because it’s not through third world countries in South America or Africa. Look, I love traveling abroad, it’s amazing. But I’d like to think that this current trip of mine, while different, is just as adventurous as when I lived in Yemen for six months, or as riding on a motorcycle, trying to avoid the cities and people, and riding through remote stretches of land. I also attended a pretty good slideshow by pro photographer Chris Collard titled Creating Compelling Images in the Natural World. He talked a little about the gear he uses while traveling, how to keep it safe and protected while on the road, and went through a series of his shots to talk about what their strengths were and what sort of imagery they use in the Overland Journal. A few of the biggest take aways for me were: 1) how virtually every shot of his incorporated a person. His point was that everyone has that shot of the giraffe or elephant or Grand Canyon or whatever, but to capture a story that draws us in, it needs to incorporate some sort of human element–for instance, instead of just getting the shot of the giraffe, shoot the vehicle and the group standing there looking at the giraffe. We all know what a giraffe looks like, but the latter image captures a little bit of what it’s like to travel through Africa. 2) He told a story about a meeting with a photo editor early in his career who asked him to bring in his best shots. Their constructive criticism was something along the lines of “You are in every one of these shots,” meaning that he, as the photographer, was impacting the scene… The subject was looking at the camera. In a more journalistic fashion, the photographer is meant to try and capture how things are happening naturally. It was something that he always remembered and tried to incorporate. Of course, he also then showed us a number of shots where the subject was most definitely impacted by the presence of the camera–looking directly into the shot. And those shots can also be very impactful and effective, but just try and be cognizant of what type of scene you are trying to capture. 3) He also criticized what he called six-oh (6’0″) photography, whereby you are always getting a shot from eye level (IE standing there). He encouraged people to explore different and more unique shooting angles, whether that means shooting covertly from the hip, getting down on your belly to shoot, or trying to get an elevated perspective above other heads. There were 100+ vendors on site displaying and selling their respective wares. From various solar panels to cooking gear to clothes to a multitude of vehicle accessories (for trucks, vans, motorcycles). Most of the companies were unfamiliar to me, it’s an entirely different industry from the standard outdoors companies, though Goal Zero and Snow Peak were familiar faces. I’m not really in the market for anything right now–that’s all I need is more stuff in my truck. Though I was curious to do more research about dual battery setups for my truck with an isolator so I could charge and run electronics off the auxiliary battery without worry of draining my main battery and being unable to start my vehicle in the middle of nowhere. I talked to a few companies with some good options, one of which is a Bellingham, WA based company that I might work with this summer back in the Northwest. I have been interested in Goal Zero solar panels and their Sherpa 50 battery pack as maybe an alternative option as well. But I can’t justify the $200-$400 price tag, particularly since I would rather go the dual battery route. I was also curious about potential additional rooftop storage above my canopy, and taking a look at those bumpers that allow fuel, water, tire, bike, etc storage. One of those things that would be nice, but probably isn’t necessary. It’s so easy to convince yourself you need to shell out more money, it seems. That afternoon I attended another roundtable discussion titled “Reinvent Your Life and the Lives of Other Through Travel” made up of a group of Muskoka volunteers who help support a variety of local non profit groups both here and abroad. They are not one of those “pay us to go volunteer” groups and they specialize in skills transference, not hard goods, whereby volunteers are connected with reputable organizations and then offer their professional services in a suitable format like workshops or other types of support. Whether that’s working with struggling orphanages, or teaching local kids photography or art. They sounded like an interesting group that might be worth looking into if you are researching volunteering opportunities abroad. That evening I was also able to connect with Twitter folks that I’ve been interacting with online for some time, namely through the Adventure Travel Q&A (#ATQA) series on occasion. It was good to meet @WildernessDave (website), @Valinreallife (website), @AmericanSahara (website), and @OverlandNomads. I headed to the evening’s showing of Mondo Sahara at the Adventure Travel Film Festival with the Twitter folks. This was a feature length film by Austin Vince, a noted and repeat long-distance motorcycle adventurer, who organized a small group of guys on a four-week, 5,000 miles motorcycle ride through the Sahara in Morocco and Mauritania. The film was apparently fully filmed, edited, and even soundtracked by Vince himself, an ardent supporter of Do It Yourself approach, especially the DIY adventure style. Vince also stated that the film was a deliberate political statement, travelling with a group of Americans and Brits deep into the land of Islam. The film was very well done and certainly inspiring. They all rode cheap, second hand Honda XR400s–in his talks he once again thumbed his nose at those companies and people saying you need a ton of money and a big, expensive, high end vehicle for this sort of adventure. Though they did hire a support vehicle that went out in advance and buried caches in the desert of fuel, water, and food for their 10-day push deep into the Sahara–an innovative approach to be sure. Given my academic background as a Middle Eastern Studies major and my own time spent in that region, I appreciated his political angle in the film, in that he was trying to show that a bunch of Westerners, specifically Americans, could travel out into the wilds of the Islamic world and would not only be safe, but would encounter some of the friendliest and most hospitable people on earth. Unfortunately, I don’t think that aspect was portrayed too well in the film, though it was quite clear from the stories and things told by Vince et al at the Q&A after the showing. Indeed, there was a very limited portrayal of any interactions with locals in the film itself, which is a shame, because that was a stated goal of the film, and they all seemed to only have good things to say. The film was filled with outstanding scenery, was actually quite humorous, and was inspirational in that it made me want to just get out there and explore the world. The morning started off leisurely with a walking tour of the vendor area who were offering up various breakfast food and drinks. This dirtbag isn’t about to pass up “free” anything! Later on I attended another roundtable discussion on North Africa and the Middle East. It was pretty much just about North Africa though, I didn’t hear about too many people actually overlanding on the Arabian Peninsula itself–though later that day Rene Cormier mentioned his time motorcycling across Yemen and Oman. Saudi Arabia is not amenable to the idea, and Syria and Iraq are obviously problematic right now, so that would defeat a lot of the overland routes through that area. At 33, Rene Cormier quit his job, sold everything he owned, and set out to drive his motorcycle around the world. 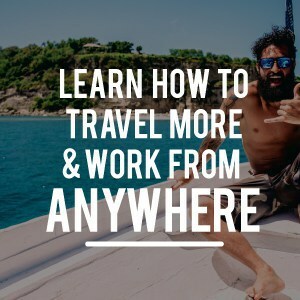 He had around $40k dollars to work with and figured that if others were doing long distance motorcycle trips for about $30/day, he could make it happen for $25/day, or around $9,000 per year. He planned to do one year down to the end of South America, one year going up Africa and into eastern Europe, and another year down and into Oceana. Of course, it didn’t quite work out as initially planned. He spent 2.5 years travelling to the end of South America, ran out of money, moved home to work and save up money for the next leg, then set about travelling Africa to the Middle East, up into the ‘Stans and across Russia. Some four and a half years of travel before concluding his journey. In his afternoon seminar he shared tales from his trips and some of the lessons he learned from all his time on the road. 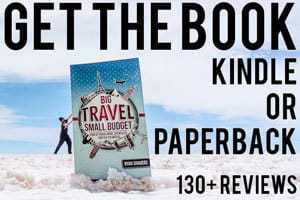 Like, to travel cheap you need the dollar cost averaging of truly long term travel. Shorter trips will necessarily be more expensive. 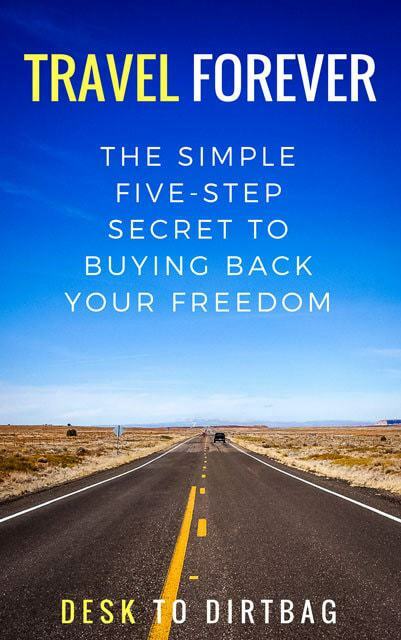 Life on the road is actually quite cheap–it doesn’t cost that much to live on the road, the real “cost” associated with it, is in giving up an earned income during that time. Travel lightly–the amount you spend on hardware and gear will directly impact the length of stay in a given place. 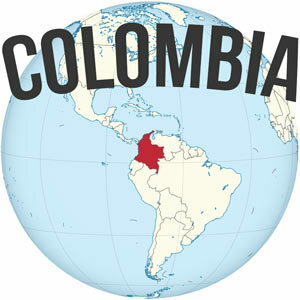 If I spend $X on this accessory that equals X number of days I could stay in South America, for instance. He also talked about “Fear Gear” where in the time leading up to departure, people have a tendency to go wild purchasing items for all the what-ifs they might encounter. I can relate: I too ended up bringing a lot of things on my current trip that I really didn’t need or use. Rene’s talk was great, and offered up a lot of value that was applicable to not just overland motorcycle expeditions but other types of large trips or even life in general. The event was starting to wind down by mid-afternoon. Many had cleared out, heading back to their respective homes. I had nowhere important to be, so I stuck around for the afternoon film showings. I caught the tail end of the Omidvar Brothers, an interesting film about two Iranian/Persion brothers who set out by motorcycle in the 50’s and 60’s to explore Africa. It was like an Iranian Motorcycle Diaries or something. Pretty unique. I also caught a couple short films: The Special Delivery about some adventure motorcyclists in Lesotho, and Live Before You Die, an awesome short that you can actually watch online, about a band of English travelers living in horse drawn wagons, travelling slowly and enjoying life. I liked Austin Vince’s comment about how Land Rover’s slogan is basically the same as the movie: get out there and live life (and buy a Land Rover); but of course through polar opposite means. Finally, I watched the White Silk Road, about four Aussies who head to Bamyan in Afghanistan to snowboard. Talk about the road less traveled… It was quite a different film from the rest, since there was no real overland vehicular travel involved. But it was compelling in the connections these guys made with the local Afghan community, working with the one and only Afghan ski guide, introducing the local kids to snowboarding, and even seeing some of the local Afghan men with 2×4’s essentially strapped to their feet, skiing down the hills, which once again just goes to show that you don’t need all the latest, greatest, and fanciest gear to just get out there, have fun, and connect with people. The Overland Expo was definitely a fun and worthwhile event, it obviously caters to a particular type and style of international travel, but I think anyone interested in travelling, exploration, or doing things a little less conventionally would find something appealing about the event. The overall message of most of the presenters was “Hey, just get out there, it’s a big world that you too can go explore. Don’t let money, things, or irrational concerns stop you from living the life you want.” As well as, “Stop buying things, and start doing things!” All-in-all, an inspiring and fun weekend. Great write-up, Ryan—terrific in-depth look at the whole show, and the philosophies behind it. You definitely noticed that many of our presenters and VIP travelers are the “go light, go now” types who bypass a lot of expensive gear. But we also love to have all the gear there, and there are plenty of people who love to buy it. What we really wanted to get across in the roundtable on the philosophy of overlanding (but it sounds like that did NOT happen) is that there IS no one definition, and we truly don’t want to cut down anyone’s style or desires. If buying a bunch of cool kit or a $200,000 vehicle is one person’s thing, great! If going around the world on a second-hand bike and a tarp for a tent is another person’s, great! If a person’s dream is to spend a year exploring America, super! If it’s to drive round the world, super! We don’t want to judge. And after all, it’s the purveyors of all that kit, and those who buy it, who keep the industry alive and give us the community framework that everyone (not just the “go light” folks) enjoys. So thanks for the great insights, we really appreciate it! Roseann, thanks for taking the time to read and comment on my write up. Great to hear your thoughts, it’s most definitely appreciated! I realize that there are different approaches and styles for overland travel (more gear vs minimalism), which is also true of climbing, backpacking, and other hobbies I’m sure. Different strokes for different folks obviously, and you guys had a little something to offer for anyone and everyone, of any given persuasion when it comes to overland traveling. I guess that’s the REAL value of an expo like this, you get to see all that is out there in terms of products, vehicles, styles of travel, and even areas of travel… Some of which might be implemented in your own endeavors. In any case, you guys did a great job putting on a such a massive and varied event, and I walked away feeling super inspired and having learned a great deal. Hope I get the opportunity to attend again in the future! Oooh…cool to hear about what you thought of Overland Expo. If we would have still been the cool kids with the Sprinter we probably would have stopped by. As it is, we’re busy with being sorta stationary right now and we feel pretty conflicted about the idea of an “expo” of stuff you should buy to go adventure. As we’ve found with our current van, it just doesn’t take that much!! Hey Beth, thanks for stopping in! Yeah, I definitely agree that it doesn’t take much. In fact less is more, especially when you’re working with such a limited space like a vehicle. The sales side of the expo wasn’t too appealing to me, but the roundtable discussions, talks, and films were great and more than make up for it. The price was pretty darn cheap too ($35 for the weekend), so I think it’s definitely worth checking out at some point, if you have the opportunity!